Yeah boy! Annabelle is clockin’. But don’t let the cover fool you. These women are FAR from hip-hop, although I’m sure Misty Knight can bust a rhyme just as well as she bust a move on the villains in this series. Each and every kind of hell has broken loose in New York City and people are turning into cocoons. Thanos army is out to destroy the cocoons, while Caroline Le Fay, that villainess I love to hate, has her own agenda. And she’s not even afraid of Thanos’ goons. That’s probably because she has her newly assembled team of female badasses at her command. I love how Caroline motioned for Thanos’ army to look upward, only for them to get pounced on by the powerful and dangerous, Scorpia, Titania, Shriek and Mindblast. What’s even better is the villainess’ face-off against Valkyrie, Misty Knight and Hippolyta. This issue introduces Ren Kimura, a character created by Cullen Bunn, the writer of this phenomenal series. Ren is a 21 year-old female dancer that was raised in a strict home environment. Her wants and needs in life has always been disregarded, as her parents sought to shape her as they saw fit. Well all that may not matter anymore, because Ren broke out of her cocoon with a superhuman ability, razor-sharp fingers. Of course Caroline Lefay has her evil eyes set on Ren and the rest of the cocoons. The Fearless Defenders is a series that is full of surprises. You never know what Bunn is up to, whether it’s a new defender or a new costume. By the way, I like Misty Knight’s new ‘do. Dialogue is always full of energy and laughter, fun and easy to follow. Characterizations are at its’ finest, and I especially like Hippolyta, the strong and powerful, but arrogant Queen of the Amazon (well late queen, remember she was raised from the dead). Annabelle is always funny. She got on my nerves in the first issue, but I’ve grown fond of her over the past few months. This is how you know that a story is good. If emotions are triggered, then it’s a good story. Will Sliney and Veronica Gandini never cease to amaze me with their awesome art and colors. And you seriously need therapy if Mark Brooks’ covers don’t reel you in. 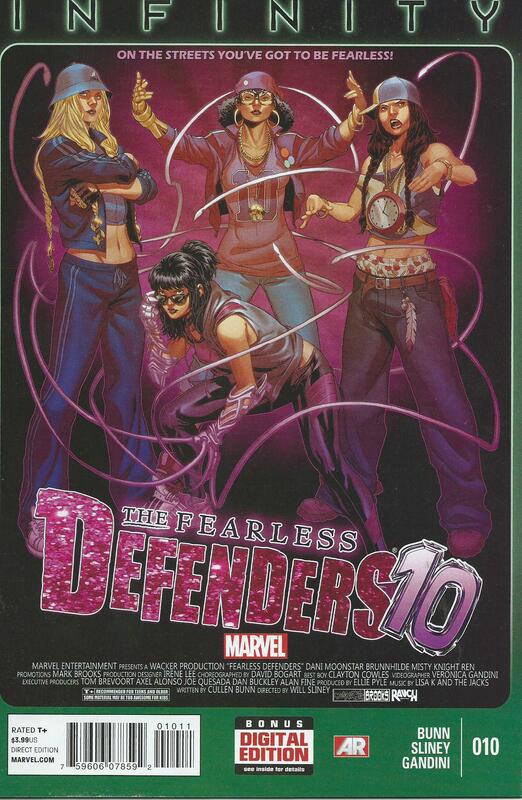 The Fearless Defenders is definitely one title I am hoping will stick around for a very long time.